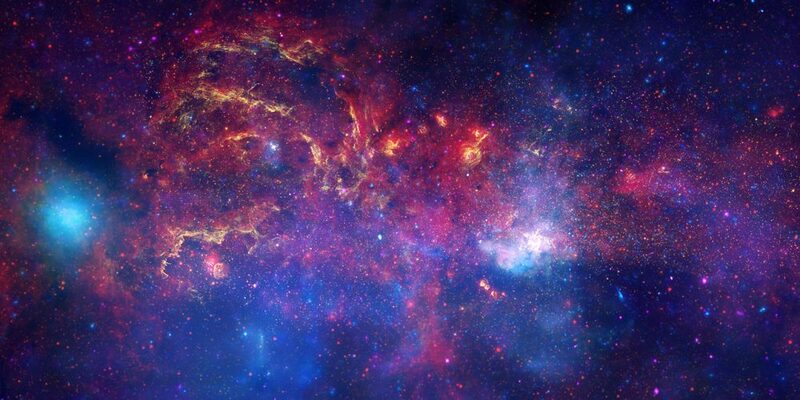 Sagittarius A (Sgr A) is a complex radio source located at the centre of the Milky Way Galaxy. 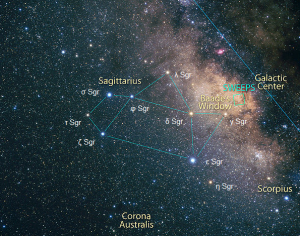 It lies in the direction of Sagittarius constellation, near the border with Scorpius. The radio source consists of the supernova remnant Sagittarius A East, the spiral structure Sagittarius A West, and a bright compact radio source at the centre of the spiral structure, called Sagittarius A*. Sagittarius A* (pronounced “Sagittarius A-star”) is the most plausible candidate for the location of the supermassive black hole at the centre of our galaxy. The black hole at the centre of the Milky Way lies at a distance of 26,000 light years from Earth. 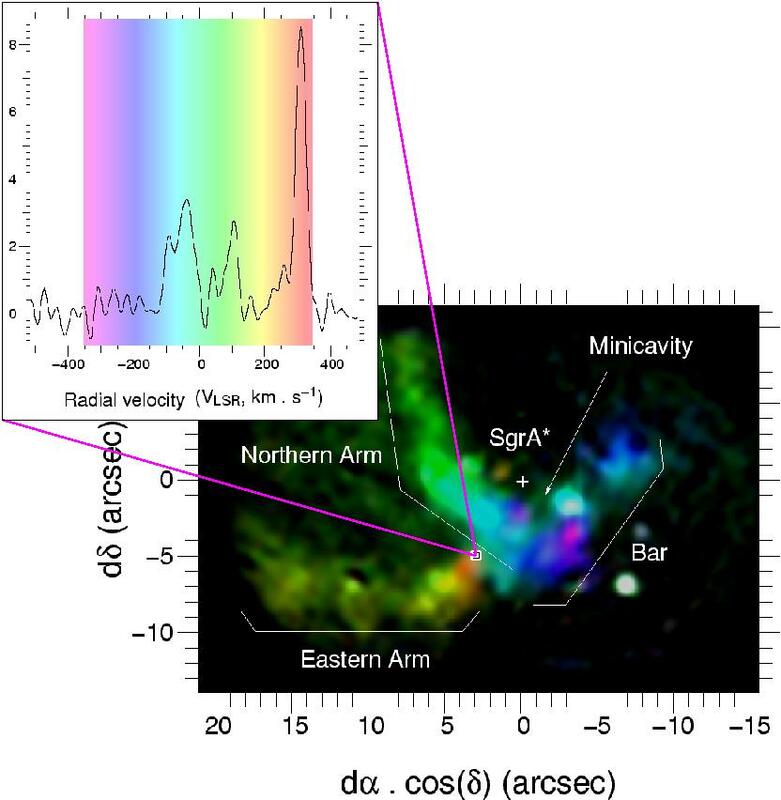 Sgr A can’t be seen in optical wavelengths because it is hidden from view by large dust clouds in the Milky Way’s spiral arms. 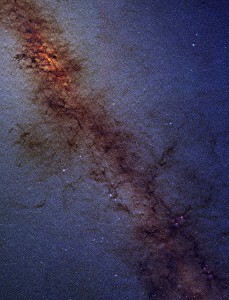 Center of our Milky Way Galaxy, located in the constellation of Sagittarius. In visible light the lion’s share of stars are hidden behind thick clouds of dust. This obscuring dust becomes increasingly transparent at infrared wavelengths. 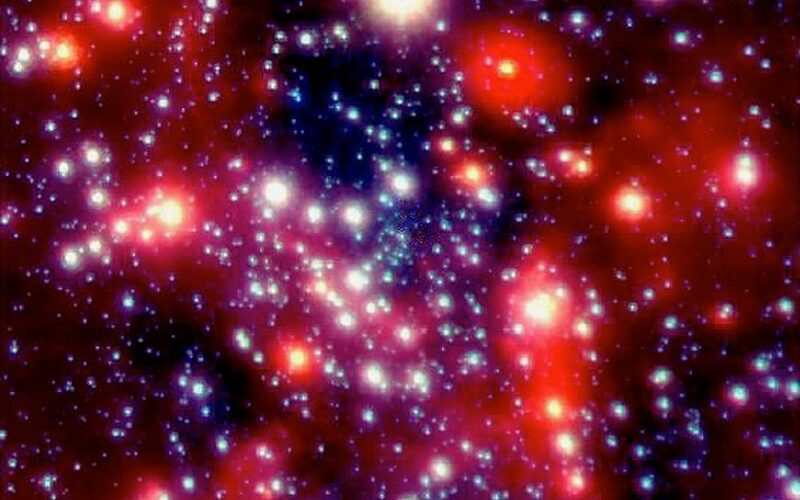 This 2MASS image reveals multitudes of otherwise hidden stars, penetrating all the way to the central star cluster of the Galaxy. 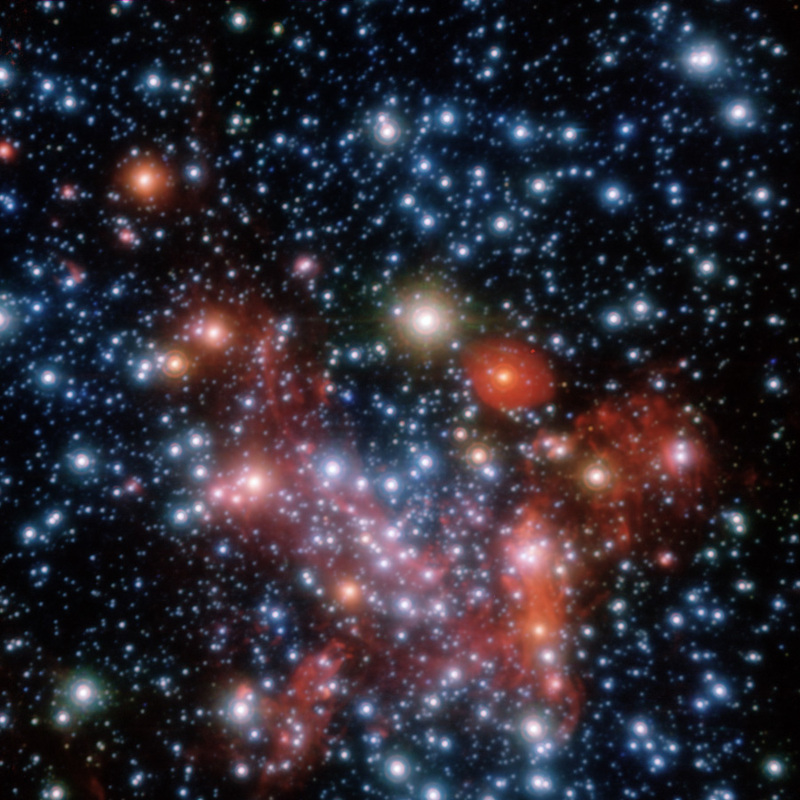 This central core, seen in the upper left portion of the image, is about 25,000 light years away and is thought to harbor a supermassive black hole. The reddening of the stars here and along the Galactic Plane is due to scattering by the dust; it is the same process by which the sun appears to redden as it sets. – Atlas Image mosaic obtained as part of the Two Micron All Sky Survey (2MASS), a joint project of the University of Massachusetts and the Infrared Processing and Analysis Center/California Institute of Technology, funded by the National Aeronautics and Space Administration and the National Science Foundation. The Galactic centre is best observed in infrared light and radio waves. The three components of Sagittarius A overlap. The supernova remnant Sgr A East is the largest component. The spiral structure Sgr A West appears within Sgr A East, while Sgr A* lies at the centre of Sgr A West. 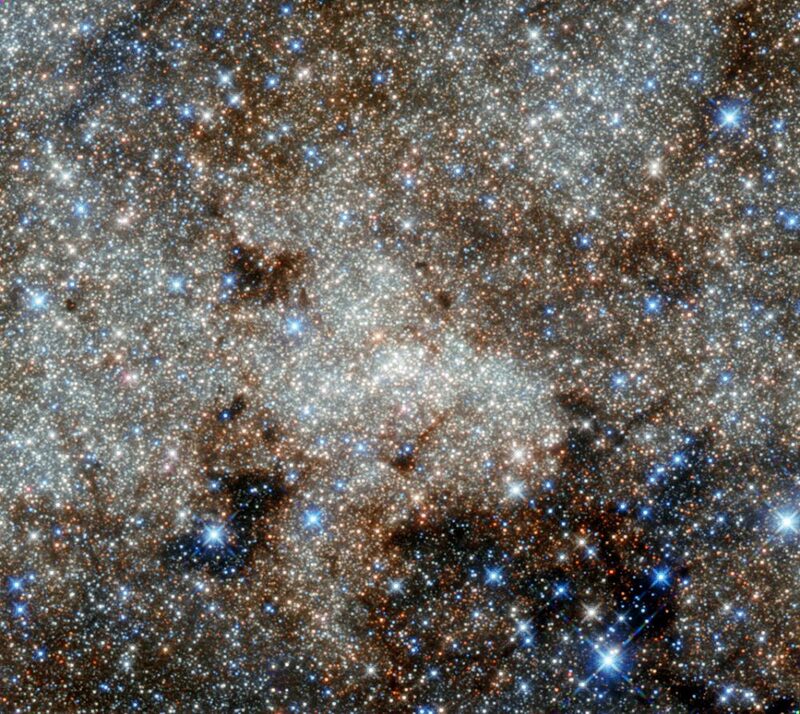 The supernova remnant Sagittarius A East is a non-thermal radio source located within parsecs of the Milky Way’s centre. The size of its radio shell is the smallest of the known mixed-morphology supernova remnants. Sgr A East is about 25 light years wide and is believed to have formed after a supernova explosion that occurred between 35,000 and 100,000 BCE. However, the size of the object indicates that it would have taken 50 to 100 times more energy than a standard supernova event to form a remnant this wide. For this reason, the star that exploded in the supernova event is conjectured to have been gravitationally compressed because it had made a close approach to the Milky Way’s central black hole. The spiral structure Sagittarius A West is sometimes called the “Minispiral” because it appears as a three-arm spiral when observed from Earth. However, the object’s appearance is misleading because its three-dimensional structure is not that of a spiral, but it is made of clouds of dust and gas that orbit Sgr A* and fall onto it at great velocities, up to 1,000 km/s. The clouds’ surface layer is ionized by a hundred or more massive OB stars found in this region. The Sgr A West structure is surrounded by a Circumnuclear Disk (CDN), a massive clump of molecular gas. 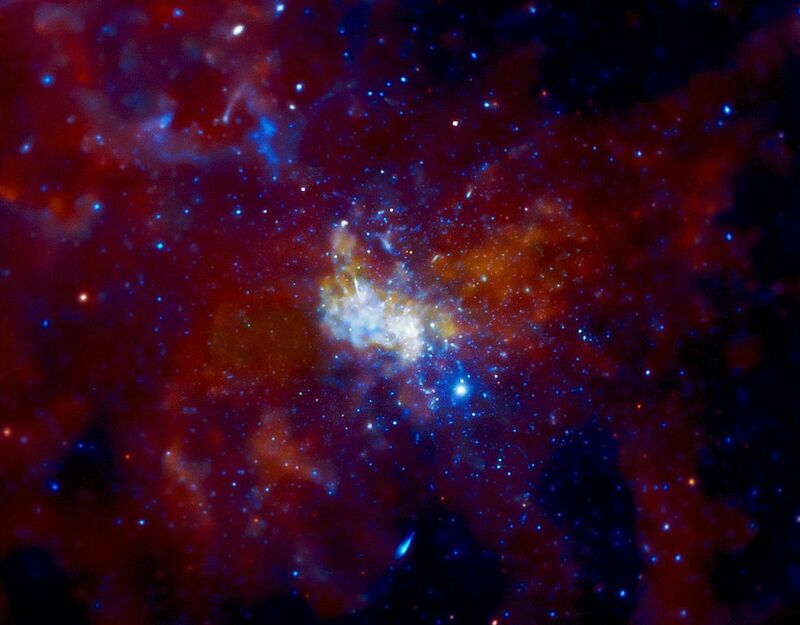 Sagittarius A* is believed to be the location of the supermassive black hole in the centre of the Milky Way Galaxy. Astronomers have detected stars orbiting Sgr A* at speeds much greater that those of any other stars in the Milky Way. One of these stars, designated S2, was observed spinning around Sgr A* at speeds of over 5,000 km/s when it made its closest approach to the object. Sagittarius A* has a diameter of 44 million kilometres, roughly equalling the distance from Mercury to the Sun (46 million km). Sgr A* emits a large amount of IR, gamma-rays and X-rays. It appears motionless, but there are clouds of dust and gas orbiting it, which provides a clue to the nature of the object. Astronomers calculated its mass using Kepler’s laws and measuring the period and semi-major axis of the orbit of a star that came within 17 light hours of the object. They arrived at approximately 4 million solar masses. The only kind of object that can be that massive and have a radius of about 100 astronomical units is a black hole. The object was discovered on February 13 and 15, 1974 by astronomers Robert Brown and Bruce Balick at the National Radio Astronomy Observatory. The motion of the star S2 over a period of 10 years was reported on October 16, 2002 by an international team of scientists led by Rainer Schödel of the Max Planck Institute for Extraterrestrial Physics. Their observations using near-infrared (NIR) interferometry strenghtened the theory that Sgr A* was the location of a massive black hole. NASA’s Nuclear Spectroscopic Telescope Array, or NuSTAR, has captured these first, focused views of the supermassive black hole at the heart of our galaxy in high-energy X-ray light. The background image, taken in infrared light, shows the location of our Milky Way’s humongous black hole, called Sagittarius A*. In the main image, the brightest white dot is the hottest material located closest to the black hole, and the surrounding pinkish blob is hot gas, likely belonging to a nearby supernova remnant. The time series at right shows a flare caught by NuSTAR over an observing period of two days in July; the middle panel shows the peak of the flare, when the black hole was consuming and heating matter to temperatures up to 180 million degrees Fahrenheit (100 million degrees Celsius). The discovery of an intermediate-mass black hole candidate, designated GCIRS 13E, was reported in November 2004. The object was detected orbiting three light years from Sgr A*. The black hole was detected within a cluster of seven stars and its mass was estimated at 1,300 solar masses. In 2008, the results of 16-year long observations of stellar orbits around Sgr A* by Gillessen et al. were announced and published in The Astrophysical Journal in 2009. The team estimated the object’s mass to be 4.31 ± 0.38 million solar masses. As we don’t see the object enlarged beyond its size, this indicates that the radio emissions of Sgr A* are not centred on the black hole, but come from a bright spot in the area around it, near the event horizon. In other words, the emission doesn’t come from the black hole itself, but from the material that the black hole is about to swallow up. The black hole itself can’t be seen, but observations of nearby objects are only consistent if there is one present in the vicinity of Sagittarius A*. The NASA/ESA Hubble Space Telescope, the Spitzer Space Telescope and the Chandra X-ray Observatory have collaborated to produce an unprecedented image of the central region of our Milky Way galaxy. 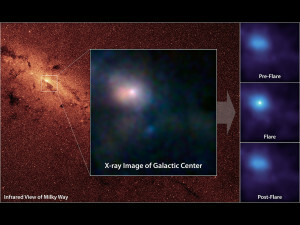 In this image, observations using infrared light and X-ray light see through the obscuring dust and reveal the intense activity near the galactic core. Note that the centre of the galaxy is located within the bright white region to the right of and just below the middle of the image. The entire image width covers about one-half a degree, about the same angular width as the full moon. This Chandra image of Sgr A* and the surrounding region is based on data from a series of observations lasting a total of about one million seconds, or almost two weeks. Such a deep observation has given scientists an unprecedented view of the supernova remnant near Sgr A* (known as Sgr A East) and the lobes of hot gas extending for a dozen light years on either side of the black hole. These lobes provide evidence for powerful eruptions occurring several times over the last ten thousand years. The image also contains several mysterious X-ray filaments, some of which may be huge magnetic structures interacting with streams of energetic electrons produced by rapidly spinning neutron stars. Such features are known as pulsar wind nebulas. Image: NASA/CXC/MIT/F. Baganoff, R. Shcherbakov et al.